LIVE IN THE MOMENT AND PREPARE FOR THE FUTURE. You are either really being in the moment, or you are not. You are either really preparing for the future, or you are not. But you cannot change the fundamental responsibility here. The New Message from God has been sent into the world to prepare you for the great change that is coming to the world. It is a lifeboat for humanity. >> Learn how to be more present. BEGIN TO PREPARE YOUR OWN LIFE FOR A FUTURE THAT WILL BE UNLIKE THE PAST. Begin with little things, and build from there—where you live, how you travel, where you work. Are these things going to be able to be sustained into the future? Are you where you need to be geographically? Are you with the people you need to be with? Are you doing the things you really need to be doing right now? >> Learn how to prepare for a future that will be unlike the past. LOOK AT THIS NEW YEAR WITH CONCERN BUT ALSO WITH HOPE, with confidence and with determination. See this New Year as an opportunity to mend the broken threads of the fabric of human life, to play your small but essential part in preparing yourself and others and indeed the world for the great challenges ahead and the hidden opportunity that they possess. >> Learn more about the opportunity of your Life. THIS IS YOUR TIME, YOUR OPPORTUNITY. Do not neglect it. Do not overlook it. Do not set it aside for other priorities, for there is no greater priority than this. This is your time. It is a time of revelation. You are living in a time of revelation, where a New Message from God is being sent into the world. >> Learn how you are living in a time of Revelation. HAVE CONFIDENCE IN THE POWER OF KNOWLEDGE THAT THE CREATOR OF ALL LIFE HAS GIVEN TO YOU, the deeper mind of Knowledge, the greater spiritual mind within you. Have confidence in the Knowledge that exists within the human family. And have confidence that with God’s assistance the human family can navigate the difficult times ahead. >> Learn how to have real confidence. FIND YOUR GREATER STRENGTH: If you have suffered with your weakness—you now have a chance to find your greater strength, and this will bring a certainty and a sense of security and direction that nothing in the world could provide for you. >> Learn how to become strong and discover true direction. SEE THE NEED TO WORK TOGETHER. This New Year will be a great one for humanity—great in the power of change that is occurring in the world and great in the opportunities it holds for individuals, groups and nations to see the need to work together. >> Learn the truth that nothing gets done alone. SEE YOUR LIFE WITHIN THE CONTEXT OF BEING OF SERVICE TO THE WORLD. If you can recognize the reality that you were sent into the world to serve the world in a specific way, if you can gain this vantage point and cultivate this awareness, then you can see that this year will be great—a year of change, a year where many signs will be given about the direction that humanity must go and the difficulties that lie ahead. >> Discover your unique opportunity to serve the world. LOOK AND SEE AND BE OPEN—without fear, without preference, without hope, without despair—but looking clearly to see, watching the signs. The signs will not be subtle. Signs at the level of the world are not subtle, but you must still look for them to see them, for they will be missed by many people. >> Learn how to see without fear or preference. WATCH THE SIGNS. HEED THEM. But do not come to conclusions quickly, for the signs must build as if pieces of a puzzle were coming together—signs of what is coming, signs of what you must do in your own life to prepare and signs of what you can do yourself to strengthen others and to be a force for good in a world that will be undergoing tremendous change. >> Learn how to read the signs of the world. DO NOT CONDEMN THE WORLD. DO NOT CONDEMN OTHERS. Take that fervor and that emotion and bring it to bear on your own life and circumstances. The person who is doing important work cannot be losing energy by condemning others, and the world does not need your condemnation. It is already full of condemnation. Do not add to its burden. And do not add to your burden. You are here to contribute, to accomplish certain tasks in alliance with certain people. You must prepare yourself for this. >> Learn how to contribute to – not condemn – the world. DO NOT THINK WHAT OTHER PEOPLE SHOULD DO. Do not tell yourself that everyone should do this or everyone should do that, for you are the one who must change. You are the one who must climb this mountain. You are the one who must find your greater strength and your greater gifts. >> Learn more about changing yourself. LOOK UPON THE WORLD COMPASSIONATELY. What is happening in the world is the product of everyone’s participation. Everyone has been drawing from the well of life, and the well is shrinking. Great corruption and injustice exist within the world, but you must look upon this and listen for the power and the presence of Knowledge, or you will be dismayed and discouraged. You will live in fear and anger, and your greater strengths will remain out of reach and out of mind for you. >> Learn how to build compassion within. OPEN THE DOORS WITHIN YOURSELF: This year is a great opportunity now to open the doors within yourself, to go beneath the surface of your mind and to realize you are living at a time of Revelation and that you have been blessed and called to receive this Revelation, to learn of it, to apply it, to study it. >> Learn how to open yourself to inner truth. TAKE THE JOURNEY IN STEPS TO KNOWLEDGE: The Book of Inner Knowing. As you take this journey, you will come closer to living the life you know you must live, able to make decisions to bring your life into balance and harmony and finding the people, place and purpose that will fulfill the need of your Soul. >> Begin the Journey in Steps to Knowledge today. >> Begin your Freedom Journey now. FORGIVENESS IS NOT FORGETTING. Forgiveness is not overlooking difficulties you have had with people in the past. Real forgiveness is a process of transforming something old into something new, something that was useless into something that is useful, something that is meaningless into something that is meaningful. >> Learn how to genuinely forgive another now. These spiritual new year resolutions are yours to take up today and use every day for the rest of your life in service to your family, your community and the world which is threatened by the Great Waves of Change and the growing influence of the Greater Community. 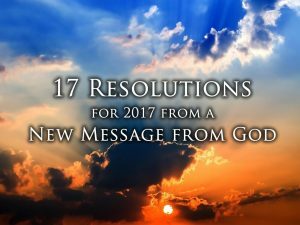 4 Responses to "17 Spiritual New Year Resolutions for 2017"
This is a powerful way to bring the many elements of God’s New Revelation to the world. Everyone wants to ride the wave of a New Year’s energy coming in and it is essential that humanity know what will be needed as we move forward into the new world that we will be facing. If God did not love humanity with a great and inconceivable love, we would be left to deal with the challenges that we have created on our own. But, God does love humanity and has provided a preparation and a practice for the difficult times that are coming. Thank you very much for these 16 steps to help us begin a deeper look into this preparation. Thanks your so very much for posting these Steps so very helpful to live a full & purposeful life. We are so very Blessed to have this wisdom for us to follow.